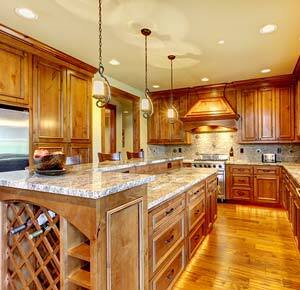 Are you worried that you might run out of money in the middle of your kitchen remodeling project? This is a common concern among our clients, which is why we work with you to create a plan that fits your budget. At Abode Building Center, you don’t have to worry about being overcharged or being expected to pay for hidden expenses. We work with your budget so that you can enjoy an improvement to your kitchen at a reasonable price. To help you get started, we have listed our top budgeting tips we give homeowners before starting a kitchen remodeling project. Oftentimes, your kitchen can greatly benefit from using space more efficiently, as opposed to knocking out walls for costly expansions. Be sure to ask us how we can increase the storage space in your kitchen. Our Kalamazoo kitchen remodeling experts can help point you towards the best storage trends for your budget. For example, we can install pullout drawers for cabinets to maximize the storage space in your kitchen. Do you live in a middle-class neighborhood? If so, you may want to hold back on installing luxury appliances and cabinets for your new kitchen. By dramatically increasing the value of your home, you risk your home becoming stagnant on the housing market should you decide to move. People who can afford more expensive homes often want the neighborhood to match. After saving up thousands of dollars for a kitchen remodel, it can be disheartening to immediately set aside 20% for unexpected costs. However, clients who adopt this tactic are less likely to be stressed when complications arise. At Abode Building Center, we always advise our clients to keep a little bit of their budget in reserve for such occasions. Kitchen remodeling projects are disruptive to your everyday life, especially if you decide to stay in your home. If you would prefer staying in a hotel while we work on your kitchen, you will want to include those costs in your budget. Some of the families we’ve worked with even took the opportunity to go away for the weekend. If any of these plans sound appealing to you, make sure that their corresponding expenses are accounted for in your budget. Once remodeling is underway, don’t change your plans. At Abode Building Center, we always make sure to check in with you to ensure you are happy with the upcoming remodel. While we know it’s tempting to add cool features, these changes are not kind to your pocketbook. Save money on unexpected expenses by not delaying your project any more than necessary. If you are an indecisive person by nature, be sure to make all your changes during the initial planning phase of the project. That way, you can feel secure knowing that your new kitchen remodel is exactly what you want. If you are interested in having your kitchen benefit from our remodeling expertise, feel free to call our Kalamazoo office at (269) 329-1800. At Abode Building Center, we are always happy to help you achieve your design dreams while staying within budget.